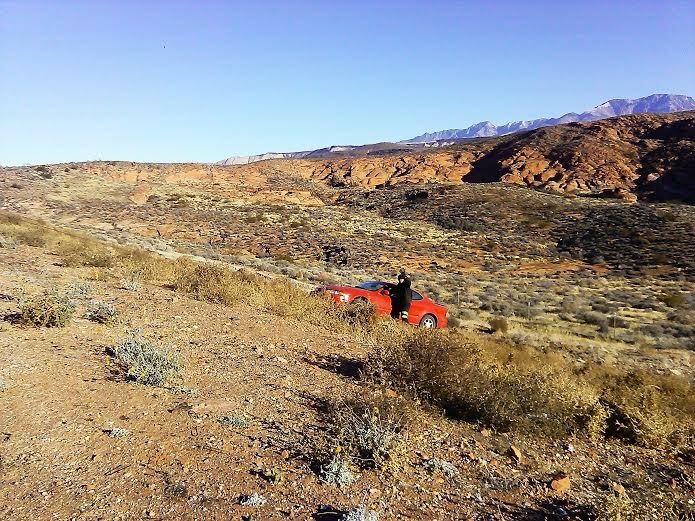 ST. GEORGE — St. George Police officers responded to an accident on state Route 18 near mile marker 6 Saturday morning after a report of a car skidding off the roadway and down the embankment. Around 9 a.m., a man driving a red Oldsmobile Alero was traveling southbound on SR-18. 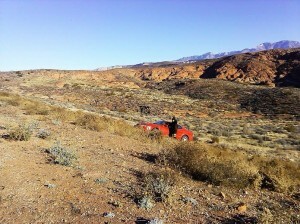 As he neared mile marker 6 he lost control of the car, St. George Police Sgt. Rich Triplett said. The car spun 180 degrees, struck a post which left an indentation behind the passenger side door, and then continued down the steep embankment where it came to rest on the west side of a fence. St. George Police, St. George Fire Department and Gold Cross Ambulance responded to the scene. The fact that the car didn’t roll is miraculous, Triplett said. A tow truck pulled the car up the slope and onto the side of the road. The car showed minimal damage and was still operable. The driver was cited for improper lane travel. The only big gust of wind is the hot one coming from this drivers mouth trying to explain away this accident…. Check his Phone records. You will find the problem. Passing Vehicle blew him off the road. Right?? Naw… I’d rather go by what the witness said. We came upon this accident moments after it happened and stopped to help. I was so afraid what I was going to see as I approached the embankment. So thankful that this kid was okay, I really expected to see a smashed up car lying upside down when I got there. He was very, very fortunate. After considering the report and speculations thus far, It seams likely to me a possible low flying drone or a urinating deer distracted the sober driver. Or maybe a ‘Hands Up- Don’t Shoot’ protester’s sign. And a citation for a improper lane travel violation? What the heck does that mean? (hum) Maybe the driver might be in terrible trouble with the BLM for violating the turtles stomping grounds during mating season . Definitely a drone! The driver was probably one of those Libertarian pro gun kooks and the driver was on some watchlist! There were chemtrails spotted in the area too…. New guy your probably a ugly low life sicko with no friends and no life this guy is a stand up citizen with high value s in life I’m sure unlike you . A person who gets off being a dum smart a..* behind closed doors only of course . What do you guys do sit here waiting to be a jacka..* ?